When the result of Bihar Intermediate Council for year 2012 is going to be declared? can we see the result on the official website? When Bihar Intermediate Result will be decleared? plzz any body send me last 3year previous question paper of bihar intermediate/from where i can download previous year question paper of 12th?plzz help me...if any body have question paper plzz send me at my E-mail id ashishanand00@gmail.com. 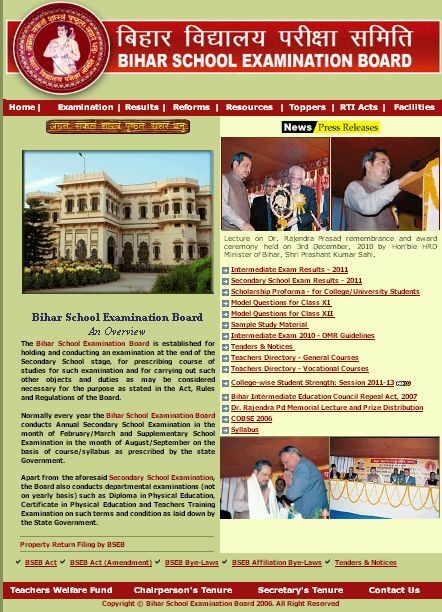 Can any one here provide me the detail for the Site of Bihar School Examination Board?? Bihar Intermediate Education Council or Bihar School Examination Board (BSEB) was established to regulate and conduct the examinations in the state of Bihar. The Exam Time table for 12th class of Bihar Board has released. The exam commence from 15th February 2014.